Mangala Samara-weera issuing a statement as the Minister of Finance and Mass Media yesterday exposed the peril suffered by the economy in just a week after President Maithripala Sirisena appointed his former nemesis Mahinda Rajapaksa as the Prime Minister in a shocking move. “As a result of the illegal and unconstitutional coup, led by President Maithripala Sirisena, Sri Lanka’s economy has been placed in great peril,” said Samaraweera, who issued the statement as Finance Minister though Rajapaksa was appointed as successor by President Sirisena mid-last week. “The uncertainty created has triggered an immediate negative impact at a time of tremendous fragility in global financial markets,” Samaraweera added. 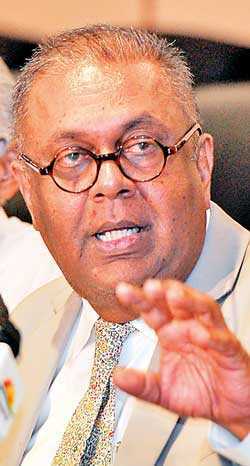 Following are excerpts from Samaraweera’s statement. The first impact was felt in the stock market. Between Monday and Thursday net foreign outflows from the Colombo Stock Exchange were Rs. 4 billion in just a four-day period. For the entire nine months (270 days) from January to September, the total net outflow from the stock market was Rs. 6.1 billion. Foreigners are selling out rapidly due to a sharp drop in confidence in Sri Lanka’s economic management. These outflows are putting major pressure on the rupee in an already fragile global economy. The yield on the $ 1 billion international sovereign bond maturing in January 2019 increased from 5.6% to 9.9% this week – almost doubling in an unprecedented manner. The spike in yield is because global investors are demanding a higher return for the very recently increased risk associated with Sri Lankan debt. This means Sri Lanka’s external borrowing costs will almost double. If Sri Lanka is unable to meet its external obligations we will collapse into a situation like Argentina or worse, Venezuela, where similar reckless policies were implemented. It is our citizens who will suffer as a result of this reckless, opportunistic behaviour. In Argentina, a country with similar challenges to Sri Lanka and made key policy errors like what we saw this week, interest rate just reached 74%, inflation is 22%, and the peso depreciated 115% this year. As a result of the accelerated foreign sales of debt and equity, there will be significant pressure on the value of the rupee and will cause domestic interest rates to spike. The selling rate of the rupee that had stabilised below 175 spiked from 174 to 177.3 in just four days. The old Rajapaksa strategy of selling off our hard-earned reserves to try and defend the rupee has no doubt already been deployed – this has been proved time and again to be a failed strategy. Lost reserves will make it even more difficult to meet our upcoming external debt repayments. There is already significant upward pressure on domestic interest rates as liquidity had tightened sharply – it is highly probable that the Central Bank will have to increase interest rates in order to withstand the pressure that has developed this week. This will increase costs in borrowing across the board and will stifle investment and economic activity. Sri Lanka had just managed to turn around our declining exports and stagnating FDI. In 2017, we had our best-ever exports and FDI, and in the first half of 2018 these figures continued to grow. Unfortunately, the blatantly undemocratic, unconstitutional measures by this illegal regime have put at risk our hard won access to the EU market through the GSP+ scheme. If we lose this market, we will severely undermine our fishing and seafood sector and apparel sector, which were making strong inroads into the world’s largest single market. A return to inward looking, protectionist, regressive policies will put us back on the fast lane to economic crisis. There is a serious risk that rating agencies will downgrade their Sri Lanka ratings. In addition to the spike in yields on Sri Lankan international sovereign debt, the incoherent policy of this week will make creditors extremely reluctant to lend to Sri Lanka to enable us to refinance our $ 15 billion debt payments in the next three years. We are at very serious risk of our first-ever international default unless the economy is re-stabilised immediately by reverting to the policy path that our Government had carefully put in place. Sri Lanka’s Ministry of Finance and Central Bank had worked hard to build fiscal consolidation and macroeconomic stability in the last two years – sacrifices were made in order to ensure we gained the trust and credibility of global financial markets since we have such high external debt obligations between 2019 and 2022. This credibility has been eviscerated in the most irresponsible manner by an illegal regime in just one week. The range of tax cuts made on Thursday will severely undermine Government revenue. In a context where we have Rs. 2 trillion worth of debt service in 2019 and our revenue in 2018 was just touching Rs. 2 trillion – any revenue slippage will be disastrous for the Government’s ability to meet its financial obligations and to fund public services. Taking just three of the 15 tax measures proposed – Telecommunications Levy reduction, VAT threshold increase, and WHT on interest income – the revenue impact would be around Rs. 75 billion (almost double the annual expenditure on Samurdhi). Unless, of course, by removing the 5% Final Withholding Tax they are expecting interest income to be declared as income tax and charged 24% tax instead of 5% applicable at present. It is not clear as to how this illegal administration expects to reduce Government expenditure in order to balance the budget after these erratic, irresponsible, and populist tax cuts. In the first six months of 2018, total revenue was Rs. 925 billion. Expenditure on salaries and wages was Rs. 316 billion, interest payments were Rs. 391 billion, and welfare was Rs. 223 billion. These three items alone add up to Rs. 930 billion. Will Mahinda Rajapaksa reduce the size of the public service? Will he cut salaries? Or perhaps he will reduce pensions? In fact, with the spike in treasury yields as a result of this coup, interest expenditure will be far higher than previously estimated. The only other option is drastic cuts to development expenditure which our Government was not willing to do. Simply saying that lost revenue will be caught up by “rationalising Cabinet Ministers” and “re-examining capital expenditure” is an irresponsible and lazy attempt to deceive the public. By shelving the fuel pricing formula, the illegal administration is attempting to revert to the opaque, politicised regime of fuel pricing that resulted in the CPC being landed with debt of more than Rs. 350 billion – which is eventually borne by tax payers. There has been a 12% reduction in the Singapore Platts price of refined petrol since 10 October, which would have enabled a reduction in pricing as per the fuel price formula as well. Our Government had put in place a carefully thought out, responsible set of programs to stimulate economic growth and uplift the people. Enterprise Sri Lanka loan schemes have been making great progress in empowering small business and entrepreneurs, and Gamperaliya has resulted in a major drive to boost economic infrastructure in rural areas. Our pragmatic macroeconomic policies brought inflation under control and in fact, food prices declined by 2.3% in October. We did not resort to cheap, short-sighted, irresponsible measures like those proposed this week. I urge the public to not be fooled by these unsustainable gimmicks and to reject all undemocratic, unconstitutional measures of this illegal regime.